February 20, 2017 Chris S.
Yet again this month (February 2017) I read in the news about another gay wedding cake discrimination lawsuit and a Supreme Court ruling about a florist who refused to serve a gay couple. At first, I thought this was disgusting, that people who simply love one another could be treated so badly. Then I paused and thought about this for a moment. And then I smiled. I smiled a grin of victory and not discrimination. I wasn’t smiling for how these couples may have felt when a simple cake could become a flashpoint for polarized opinions. No. I smiled because if this is where we are now, if this is how bad things are at the moment with the gay community, then I’m okay with that. As I am not a member of the gay community, I cannot know what it feels like to be faced with these challenges. I have lived in Hollywood and West Hollywood for decades, with gay neighbors and co-workers, so I am close enough of an outsider to have at least some empathy. And it is with this point of view that I considered how ‘Gay America’ has evolved over the last 30 or so years. As a kid, calling someone of ‘homo’ was a school yard insult, not levied at anyone gay, but just as a stigma to call someone names. I later learned about wide spread discrimination that gay people have faced like the Stonewall Riots and pink triangles on homosexuals in Nazi labor camps. Then in the 1980’s, we all became aware of the horrible mystery disease that seemed to be taking the lives of gay men, which was given the name, AIDS. As the virus spread, more and more gay men died of this horrible condition, which not only affected their loved ones and community, but also brought about a drain on the brilliant creative minds in the arts, academia, and other fields. Indirectly, at least, the AIDS epidemic was now affecting us all. My neighbors in 1997, a gay couple, both had the syndrome and were not expected to survive much longer. Then a miracle, or at least a medical breakthrough occurred, with new drug combinations and treatments that slowed and even reversed the deadly nature of the disease. Their heath returned, their lives were spared and they returned to their normal activities. The death sentence seemed to be over. To this day, I know many people living with HIV who have no trace of the disease. Things continued to get better and better: TV sitcoms featured openly gay characters, actors and musicians came out of the closet, fewer teens committed suicide and even politicians who are gay or lesbian became comfortable with their orientation without the threat of losing their jobs. And with the victory of the Marriage Equality ruling, gay couples could now get legally married in the United States. Of course, there are those who push back against this progress, but the momentum is still moving forward. And this is the perspective that I have when I hear about wedding photographers, florists or bakeries who choose not to serve gay customers. I’m not making an argument for either camp, just recognizing where we are now, and how far we have come in this country. Not so long ago, violence against gays was rampant and a modern day plague threatened to kill all gay men. Today, gay couples are going to their own weddings instead of their own funerals. And if a few florists and photographers haven’t caught up with the times, so be it. 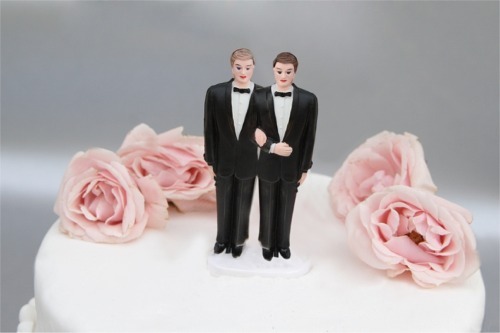 With all the horrible death and destruction in recent years, any difficulty finding the right baker for a gay wedding, is just, well, icing on the cake.